Kimble's Corner: Jack Kimble's Short Bus Tour of America - Liberty or Bust! 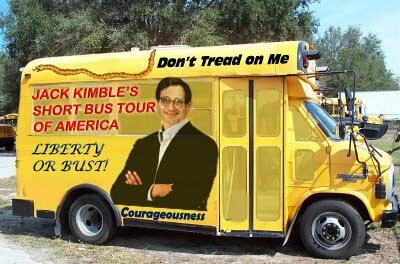 Jack Kimble's Short Bus Tour of America - Liberty or Bust! Having recently adopted a daughter has been wonderful. She's a true delight and has had no problem pitching in around the house or with our direct mail campaign, assuring me we made the right choice when we adopted her. Unfortunately, with her in California and me doing our country's business in Washington we've really been able to keep in touch via letter and that's just not the same as being there. I remember fondly the road trips my family took when I was little. My brothers, sister, and I had so much fun discussing politics with my father and tormenting the chauffeur as we took our traditional cross country road trip to the Hamptons or Myrtle Beach. I wanted to give my new daughter a chance to get to know me as we took the same kind of family road trip I used to love and we got to explore America together. We'll be starting in Washington D.C. on July 17th and we'll be sure to hit both Lexington, KY and Concord, NH where the first shots of the American revolution were fired. In New York, we'll see the statue of Nathan Hale whose dramatic words, "give me liberty or give me death" inspired a new nation and in Eureka,IL we'll see the birthplace of Ronald Reagan. I will be sure to share my reflections of the tour, which I am now calling the "Liberty or Bust Tour". We'll be giving away free Bounty Paper Towels and we'll be selling tour t-shirts on the road. We're only using a short bus because it doesn't seem that Ayn and I need a huge bus for just ourselves. The bus looks amazing in "Don't Tread on Me" yellow.